There is one position on the baseball diamond that I can relate to back during my days playing youth baseball. This is a position where many managers are hired. This position, which is involved in every play, has much intrigued and is also my favorite position player to interview. During my first two years playing, my father who managed my teams tried me at every position and I struggled. But one day, our two starting catchers didn't show up and he asked who wanted to play the position? I raised my hand as high as I could and I was quite loud during the 1973 season playing for the Southfield Wildcats. again. One of those catchers quit the team in the middle of the season. Back then, I was about 4-5 and weighed around 60 pounds. Unfortunately during that season, I lost my Grandfather Sidney Morganroth due to Cancer but our team went on to finish 21-0 and won the City Championship. But I enjoyed warming up the pitchers during innings, talking to the umpires and batter, all while getting in their head to distract them, and framing balls and turning them into strikes. I also took a beating behind the dish getting drilled with foul balls and was in my fair share of collisions. But that was the nature of the position and I liked being involved in every play. Over the years, some of the catchers I've interviewed were Lance Parrish, James McCann, Brad Ausmus, Jake Rogers and now Ray Fosse. I've enjoyed everyone of these and we definitely speak the same language. Fosse, 71 is an interesting story. He played MLB from 1967-1979. He appeared in two All-Star Games in 1970 and 1979. He won a pair of World Series Championships in 1973 and 1974 with the Oakland A's. He also won two Gold Glove Awards and had a career fielding percentage of .986. Fosse played in 924 games and had a career average of .256 with 61 HR and 324 RBI. His 12-year career was marked by injuries. But Fosse was best known on the diamond for what happened during the 1970 All-Star Game at Riverfront Stadium in Cincinnati, Ohio. He was a member of the Cleveland Indians at this time. On the last play of the game, he was involved in an incident with Pete Rose as he was barreled into in what was an extreme collision. These are definitely uncommon in an exhibition game and this situation is prominently seen in MLB All-Star highlights. Fosse has been a color commentator for the Oakland A's on NBC Sports California since 1986. As I spoke to him in Mesa, AZ., I was amazed at how much he knew about baseball and he was very knowledgeable and candid when we spoke. This was long before we knew that the small market Oakland A's, who are 90-60 as of this post, and barring an unlikely collapse appear to be headed to the playoffs. We had a great conversation and I hope all of you enjoy it as much as I enjoyed talking to Ray. Q: There is no way that I can have an interview with you without asking what it was like to be bowled over by Pete Rose in the All Star Game? 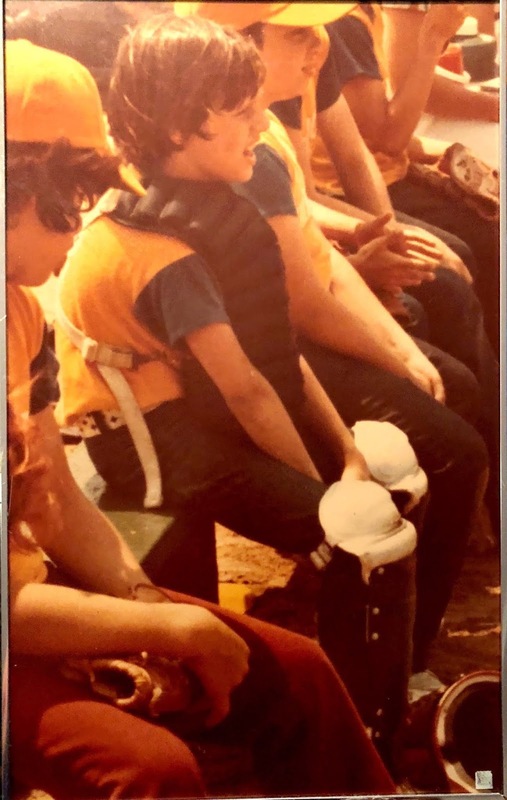 A: I was very happy to be on the All-Star Team and Earl Weaver picked me to be on the team. Bill Freehan started and I got in the game. It was very unfortunate one of those things happened. It's a changed game and that wouldn't happen today just because of a lot of situations. First of all, you can't do it. I wasn't trying to block the plate. I was going where Amos Otis had thrown the ball. As it turned out, it was up the line and the rest was history. Q: Would you say that Miguel Cabrera's one of the best pure hitters you've ever seen? like Rod Carew, for example, one of the best hitters I've ever seen. But you know if you think about what Cabrera does today and how he makes adjustments, I think that puts him in a category by himself. Q: To preface what you're saying, how impressed were you when Cabrera won a triple crown and that's awfully hard to do? A: Well especially, a triple crown you're going to have power or you're going to hit for average, but to do all of those things that's to me as great of a hitter as he is. I can't remember the pitcher of the A's had but Miguel came back from the birth of a child, he hadn't been with the club for three to four days, he came back and took early batting practice. The first at bat he hit a home run to right field and the second home run to left field. I said you've got to be kidding me! Here's a guy that hadn't of picked up a bat in three or four days. Again, to be one of the best hitters he is, it's fun to watch him. He's a fun loving guy and I think he plays the game the right way. To have fun with the fans when he goes to the sidelines and gives them a baseball and does things. This is a game where you want fan experience. I think between being a great hitter, a great person, he exudes that when he's on the field especially with the fans. Q: Of all the hitters you've seen over your lifetime, would you easily put Miguel Cabrera in your top five or 10? A: Absolutely! I'd say so because again, I was behind the plate for many hitters that Harmon Killebrew for example was a big power hitter. Like I said, Rod Carew, it's hard to pitch him any particular way. But I think Cabrera, his intelligence of the game, he knows his swing, the hitters, the pitchers and he knows what he needs to do. I haven't seen a hitter as good as him. With the new schedule the way it is with the A's facing the Tigers seven times a year, I think it's better. He's such a good hitter no matter the times they play. Just a footnote here: The Oakland A's won the season series 7-0 this year as Cabrera missed all the contests due to injury. Q: What are your thoughts about Jack Morris and Alan Trammell finally getting into the Baseball Hall of Fame? Was this long overdue? A: I think these guys were long overdue. What's interesting about Alan Trammell and the Tigers starting 35-5 in 1984, with him and Lou Whitaker at the top of the batting order, they'd get on and it would be runners at first and third. Then somebody would drive them in. It seemed like they were on all the time. But to have a double play combination like that as long as Trammell and Whitaker were, I'm happy for Alan. He's very unassuming. He doesn't tout himself so I'm sure he's ecstatic. For Jack Morris to pitch as well as he did against the Atlanta Braves winning Game Seven for Minnesota in 1991, 1-0 in 10 innings, no body is going to do that today. You're going to go six or seven innings max. But Morris kept going out and he was the best pitcher for that. He said, I'm going to go and he kept going. I don't think there is any doubt that both deserve to be in the Hall of Fame. But like you said, it's too bad it took so long, but eventually they did get in. Q: Why do you think Whitaker hasn't even sniffed the Hall of Fame? A: I think a lot of that has to do with offensive numbers unfortunately. The fact that they (Alan & Lou) played so long together, you'll never see that again as long as they did as a double play combination. But Lou was Lou. It is unfortunate but defense isn't as recognized that much anymore. It's more what you do offensively. Even though in that particular year (1984 World Series Champions) both Lou and Alan had have tremendous seasons leading off for the Tigers. I'm sure the late Sparky Anderson is already there with both of them in. But at least Trammel is in now. Q: Do you feel the Detroit Tigers are going about things the right way by rebuilding? A: I think you eventually have to do that because under the late Mike Ilitch, it was different. I know for Al Avila, it's different for him because maybe the resources aren't there anymore. That's why the late Gene Autry unfortunately didn't get a World Championship and he spent a lot of money. Michael Ilitch spent a lot of money. You spend the money and it doesn't guarantee anything. So to do it the right way, the problem speaking of Miguel Cabrera, he makes a lot of money, and nobody is going to pick up that contract even though he is the best player in the game. He makes a lot of money. I'd say he's still young enough (age 35) and you can still build around him. When you have to eventually make that commitment to do the things you have to do to get back to respectability, and even if it means tearing it down and going to young players, so be it. The heck with the people that say you're tanking and trying to get draft choices. No you're not! You're trying to develop a good ballclub for the future. I look at the A's right now. Everybody says low payroll. Well yes, they're young players. Those players eventually get paid. After three years arbitration and free agency after six years. You're going to get your money if you're good. But still, I can't knock the organization for doing it the right way. In the Tigers case, you have to do it and more power to them. When you look at the past three World Series Champions, the Astros, the Cubs and the Royals, all of those clubs were bad not that long ago. And then they're World Series Champions. You have to do it the right way. You have to think about the future and the thing is to be honest with the fans. Let them know this is the core group of guys that will be good and we're going to build. The Astros did it the right way. They lost 100, used their young guys and brought in veterans and they supplement what you have. Q: What are your thoughts about Ron Gardenhire? A: He loves cheeseburgers. I'm sure he still does. I think the game would be wrong to say that managers like Ron Gardenhire, Bob Melvin and even Joe Girardi, which that firing was unjustified. He was one guy that managed 10 years and one of the most successful managers in baseball. I'm happy for Ron Gardenhire and I'm happy the Tigers realize he's a good baseball man just like Bob Melvin. I've been around baseball a long time and I've seen a lot of managers. Personally, I think Bob Melvin is one of the best in the game if not the best. The players love him, he demands things from the players even though he can be considered a players manager. But there are a lot of analytics going on in baseball that you have to make changes and managers have to do that. But I'm happy for Gardy. He's a good man and considering what he's been through health wise, to be able to come back, I think it's great for the Tigers. Q: What is Ron Gardenhire's biggest strength that he offers the Tigers? A: He's been there and knows what it's like under Tom Kelly. If you look at the Minnesota Twins, they won in 1987. They disbanded than won in 1991. When you're around that type of organization, the important thing is to do that. If you win, you have to pay, and in today's world, it's a lot of money. If you win and you have that core group of guys, you may keep those guys but you supplement. As guys retire, other guys come in and take over. But you keep a core group of guys around. In todays world, it's very expensive. But I think Gardy can communicate and understand the young players. He's also a veteran manager and knows how to manage the game. Q: We've talked about Mike Ilitch, what are your overall thoughts about him? A: When they wore the Mr. I on their sleeves last year, here is a man that knew Victor Martinez was injured, they realized they needed a player and they signed Prince Fielder and paid him $200 Million just because Mike Ilitch said let's do it. You don't see a lot of owners doing that. That's how great Mr. I was. I heard some stories about the Auto Industry and how he let the cars in center field not have to pay. He was a good man. But still unfortunately he passes away and the transition for the Tigers is what it is right now. The resources maybe aren't there. When you have those resources, you're not afraid to spend money that means you can sign somebody like Prince Fielder and give him a contract that's unheard of. But also, remember Juan Gonzalez turned down $160 Million which is the best non-sign the Tigers have ever had. We talk about that all the time because the fences supposedly were too deep in left-field. That's a $160 Million they would have been able to do a lot of things they did since then. It's a good organization, good group of people like Al Kaline, the late Ernie Harwell, and I have so many great memories of the old Tiger Stadium, good ball clubs and you have to transition. You'd like to be a perennial winner and spend lots of money. But in today's world, it's hard to do. 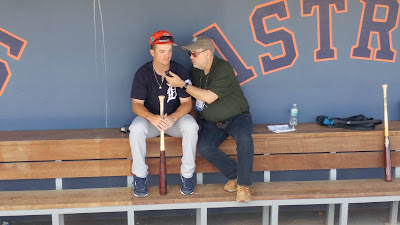 During my Spring Training coverage in 2018, I really enjoyed searching for lots of fresh content with Southeastern Michigan/ Tigers connections. Covering the Cactus League was a blast and I was amazed that I was arriving at these ballparks at 7:30 AM. You talk about a full day, those are plentiful in Arizona. As for 2019, there are two ballparks left on the victory tour. There is Scottsdale Stadium, the home of the San Francisco Giants, and the headquarters of the Arizona Fall League which its season begins on October 9th. There is Sloan Park in Mesa, the home of the Chicago Cubs which is one of the newer facilities. Any trip to Arizona consists of the LA Angels to visit my friend Tim Mead. I'll be looking forward to going back to Maryvale, where the Milwaukee Brewers will have a newly renovated stadium. I do enjoy being on the road looking for fresh local content. That's the objective with any sport and I'll reiterate on this story, it was great having the privilege spending time with Ray Fosse, a guy that I enjoyed following as a youngster. I've met a lot of smart baseball people over the years and Fosse ranks up there with the best. 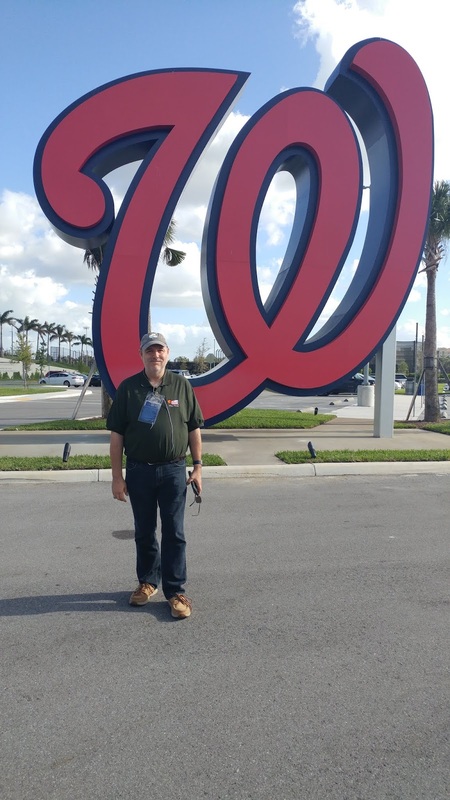 I have been in my fair share of Spring Training ballparks, but there was a certain feeling that I have when I come to West Palm Beach, FL. Back in the early 1980's, I used to cover Florida State League (FSL) games at the now demolished West Palm Beach Municipal Stadium. 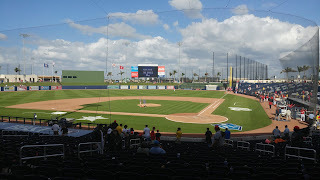 I also covered an FSL All-Star Game. The Montreal Expos had a lot of prospects that went on to play in the major leagues. 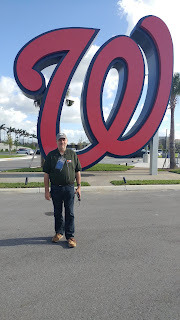 On Sunday, March 4, 2018, I returned to this city to see the Detroit Tigers visit the Washington Nationals at FITTEAM Ballpark of The Palm Beaches. The 2017 Season was the inaugural season for the ballpark. There were record crowds for the Houston Astros and the Washington Nationals (formerly the Montreal Expos), who share the same facility. On this day, the attendance was 4,481 to see these two teams compete. 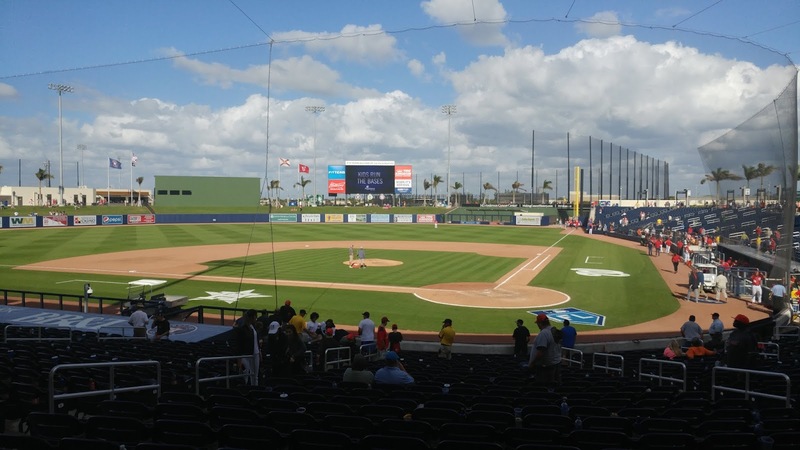 Until the ballpark opened, the closest drive to cover a game was about an hour in Jupiter from Deerfield Beach, where the Miami Marlins and St. Louis Cardinals play. Roger Dean Stadium is a nice facility. The New York Mets are about an hour and a half from Deerfield Beach in Port Saint Lucie. For me, a 30 minute drive was great which allowed me to sleep in my own bed. Otherwise, to see the Detroit Tigers in Lakeland is about four hours and requires me to get a hotel across the state, though I have commuted the trip from time to time if I get in my crazy driving moods where I like to meditate and do intense mental thinking. My wheels are always turning. To cover the Nationals was neat because it was like covering the Montreal Expos all over again. It's unfortunate that the FSL doesn't have a team yet, otherwise I'd be there a lot. One theme stayed consistent as I returned to West Palm Beach. 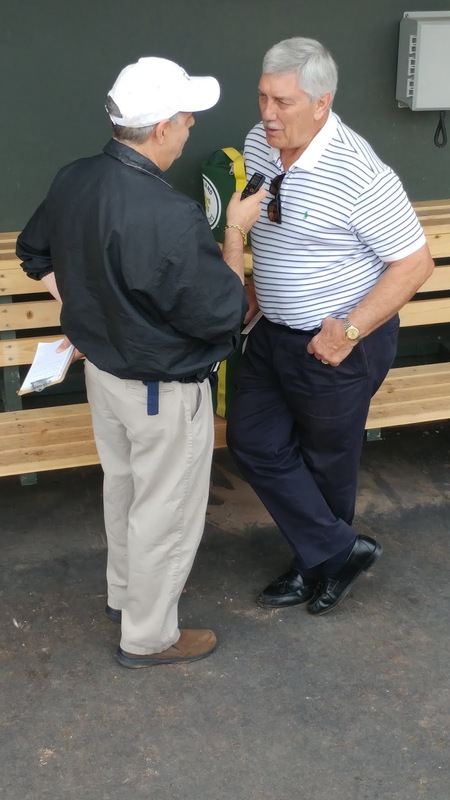 I was seeking recommendations from Tigers PR Guy Chad Crunk, who is always a huge help to me about good ideas. He suggested catching prospect Jake Rogers, who was acquired on August 31, 2017, from the Houston Astros in exchange for Justin Verlander. To date, Rogers is going to be one of the Tigers top prospects, who will be playing for the Mesa Solar Sox in the Arizona Fall League. During the 2018 season, he smacked 17 HR and 56 RBI while playing in 99 games with 408 At Bats. Defensively, Rogers had 857 put outs, 102 assists, caught 50 runners stealing with a 56% caught stealing percentage. Rogers, 23, is 6-1, 190 pounds and hails from Canyon Texas. He played college baseball for Tulane University. He's a right-handed hitter that also throws right. 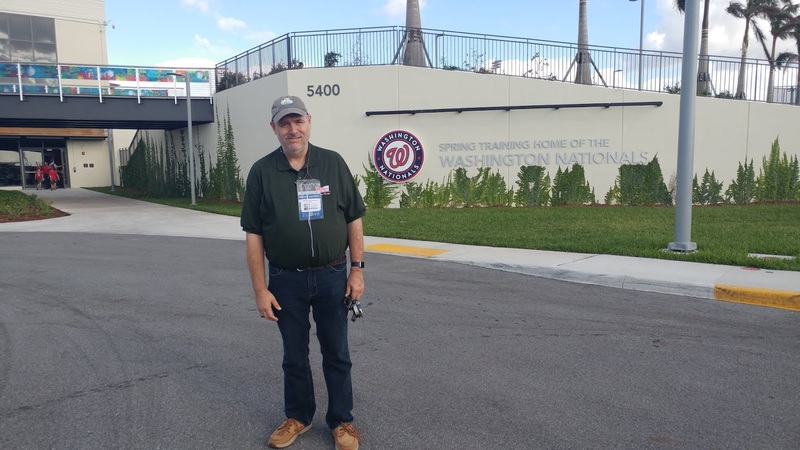 Before the Tigers 6-2 loss to the Nationals in a contest where Nationals superstar outfielder Bryce Harper hit his first HR of the Spring, Rogers and I spoke about his professional career in this exclusive interview. Q: I understand that you were acquired in the Justin Verlander trade. What were your thoughts when you heard about it? A: I had a lot of emotions going through. I was with a couple of buddies and I didn't know what to take at first. After it all settled down, I was real excited to come over and really happy to be a part of the new organization, the Detroit Tigers. Q: To be in a trade involving Verlander, were there any extra feelings involved knowing this is a guy the Houston Astros organization classified as a difference maker who subsequently helped lead them to the first World Series Title in Franchise history? A: Oh yes, for sure. Obviously, he's a great ballplayer who was a huge part of the Tigers and then the Astros when he went over there. It's an honor to be traded for him and I've been loving every second of it. Q: Tell me what it was like growing up in the Astros farm system. What did you learn from that experience that you'll be able to bring over to Detroit? A: I learned a lot from them. They drafted me in 2016. Throughout that 1.5 years I was with them, I tried to accumulate and learn a bunch of different things throughout the organization and kind of bring and accumulate into my game. When I came over here, I learned some of the stuff the Tigers were teaching. I was trying to mix it and make me the best baseball player I can be. Q: Tell me some of your strengths and weaknesses? A: Strengths, you know I'm a catcher and take pride in being a great catcher controlling the running game and getting strikes called strikes, balls called strikes, helping the pitcher out and the staff out any way I can possible. I take pride in driving runners in. That's a big part of my game. That's who I try to be. Weaknesses, I'm trying to improve on everything, everyday any way possible. If Gardy (Manager Ron Gardenhire) says something about my catching that he thinks will be better, and puts it in a professional way, I'm going to try to do it. There's little things in my game that can be made better, and everyone can do better every single day so that's what I'm trying to do. Q: Tell me what your experiences have been like this Spring Training working with Ron Gardenhire, a guy who has undoubtedly been around baseball for the longest of times? A: It's been awesome man. Gardy is a great dude and he's a players manager. He's great to be around and I've been trying to soak up as much knowledge any way I can along with his entire staff. Like I said, I'm trying to get better everyday. What, and ever they say, I'm going to try to go out there and do the best I can, then get out there and do it. Q: No Rogers interview would be complete when I mention a Kenny Rogers reference. I see you smiling a bit. Do you follow his country music at all and how do you like having the same last name? A: It's good. He's got some great music. I don't listen to him personally, but he has some great songs. I couldn't honestly name one. But I know he has some great music out there and a lot of people like him. So it's kind of cool. Q: Finally, what about Miguel Cabrera. Have you had much of any opportunity to interact with him? A: Yes. he's a great guy, man and he's fun to be around. He's a fun guy and loves the game and that's the guys I like to be around. To this date, the Tigers have won 61 games and have used a lot of players in a rebuilding season. Do the Tigers have their catcher of the future on their existing roster? I doubt it but time will tell. It will be interesting to see how Rogers performs in the Arizona Fall League. prospect that will be a future major league player. If this was a horse race, the results wouldn't even be close amongst the Florida NFL teams. On August 24, we traveled up to Tampa and saw the Detroit Lions defeat the Tampa Bay Buccaneers 33-30 at Raymond James Stadium. The Buccaneers entered the 2018 season without QB Jameis Winston, who will serve a three game suspension as a result of the personal conduct policy. There is one word that describes the Miami Dolphins. During the off-season, Miami parted ways with Pro Bowl Defensive Tackle Ndamukong Suh. QB Ryan Tannehill has been unable to stay healthy the past couple of years while running back Jay Ajayi was traded to the Philadelphia Eagles last season and played a key role in them winning the Super Bowl. Let's talk about the Jacksonville Jaguars. This is a team which finished 3-13 in 2016 and had tarps in certain levels of the stadium to hide empty seats. Gus Bradley was fired 14 games into the 2016 season and was replaced by Doug Marrone. In his interim stint, Marrone compiled a 1-1 record and the team just looked much better. Owner Shad Khan made his next big move hiring franchise icon Tom Coughlin to run the football operations. Coughlin proceeded to remove the interim tag from Marrone and that move paid big dividends as the team finished 10-6 and advanced all the way to the AFC Championship Game on January 21, 2018. New England trailed 20-10 when they began their rally. It started when Tom Brady connected with Danny Amendola for nine-yards and a score with 8:44 left in the fourth quarter to cut the deficit to 20-17. The Jags were 2:48 away from reaching the Super Bowl losing to the Patriots 24-20 as Brady threw a four-yard TD pass to Amendola for the winning score. Jacksonville led New England in total yards 374-344 as well as time of possession 35:08-24:52. During the playoffs, QB Blake Bortles was making smarter decisions using his legs to avoid negative plays and also proved he could win shootouts as well. I saw the Jaguars win an ugly 10-3 playoff game at home versus the Buffalo Bills. Jacksonville did the unthinkable by not only beating the Pittsburgh Steelers 30-9 in Steel Town during the regular season, they pulled the trick again winning in the Division Playoff Round 45-42 also in Western Pennsylvania. During the 2017 season, the Jaguars possessed an excellent defense and they were aided by the standout play of running back Leonard Fournette. When you have a standout cornerback Jalen Ramsey shutting down opposing playmakers, this is an excellent foundation. On Saturday, August 25, 2018 during Jacksonville's third preseason game, the Jaguars defeated the Atlanta Falcons 17-6. The defense chased Falcons QB Matt Ryan all over the gridiron and the offense did what it needed to do to record the triumph. Unfortunately for Jags wide receiver Marquis Lee, he suffered a season ending knee injury as a result of a low hit and was carted off the field. In three of Jacksonville's four pre-season games, the Jags limited their opponents to 10 points or less and they won all those contests. In week two, Jacksonville defeated the Minnesota Vikings on the road 14-10, I just mentioned the Atlanta game and in the finale against Tampa Bay on the road, they won 25-10. In 2008, the Detroit Lions finished with a 4-0 mark then went on to be the first 0-16 team in NFL History. The Jaguars finished this pre-season 3-1 and based on what I've seen from this team thus far, this team will be playing like One Angry Cat prowling to get to a place where they nearly tasted "The Super Bowl." During the off-season they gave Bortles a contract extension since he recorded two playoff wins. In my opinion after seeing him for three years, all Bortles has to do is simply to a better job protecting the football and not committing the deflating costly turnover. After the Falcons game, I asked Marrone what it was like to be the hunted instead of the hunter? "I don't think this team has a different mindset. I think the stuff on the outside may be different," Marrone said. "Our mindset isn't different. I think this team has an edge about them. They're real close. One of the things I'm happy with is we do play complimentary football. "They understand that we play as one and they have each others backs. They understand it takes a long time in this league before people believe you're a really good football team in my opinion when you're consistently good. Our players understand that. They push each other and we push them as coaches. They push us as coaches. When you have that, you have a chance. "When you talk individually to a lot of guys on the team, the majority of them have a chip on their shoulder. "I don't think that's bad at all." The Jags defense once again proved why it's one of the best in the league in the teams' opener in the Big Apple during it's week one win against the New York Giants on September 9. Jacksonville defeated the Giants 20-15. Just like pre-season, the Jags held its opponent to a low point total. Fournette left the game early due to a minor hamstring issue. During the week, the team was cautious about his workload not taking any chances of any long term issues. He will be a game time decision in Jacksonville's home opening rematch against the New England Patriots today at 4:25 pm in Northern Florida on CBS. I expect Jacksonville's defense to play an important role in deciding the outcome of this contest. For the record, Patriots QB Tom Brady is 8-0 all-time against the Jags. The road to the Super Bowl for Jacksonville leads through New England. This team knows that so Marrone, who I think is one of the most underrated coaches in the NFL, won't need any motivational speeches to get his players psyched up. As I look at the Jaguars, this team reminds me of the Detroit Pistons during the Bad Boys Era during the mid 1980's and early 1990's. The Pistons road to winning a pair of championships went through the Boston Celtics taking their lumps in the playoffs. Jacksonville is dealing with the New England Patriots. While Marrone is no Chuck Daly, the thing these men have in common is they worked with losing franchises before landing in good spots. Marrone left a tough situation with the Buffalo Bills while Daly departed an awful situation with the Cleveland Cavaliers. How can I not mention that Patriots Coach Bill Belichick bolted the Cleveland Browns for a second chance and he's made the most of it winning Super Bowls. But as you cover a team for a couple years and see the progression during the past two years, it's safe to say that These Cats Are Hungry! The Jags will get some National Television exposure as well. I'm looking forward to seeing the Jaguars later this year after having left shoulder surgery which is slated for the first week of November. But for now, it's safe to say that if their regular season performance mirrors their pre-season performance, then offensive coordinators from around the league will have to buy tons of Tylenol to figure out how to solve this potent defense. As I mentioned before, as long as Bortles and Fournette are healthy and productive, this team has a punchers chance to be Super Bowl contenders and take that next elusive step.